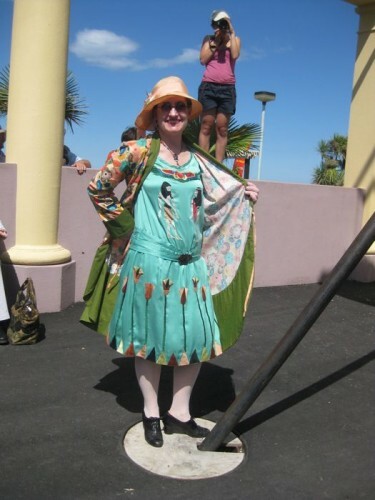 Last week I posted the tiniest bit about my wardrobe for Art Deco Weekend 2012, but I didn’t really tell you much about what it was about. 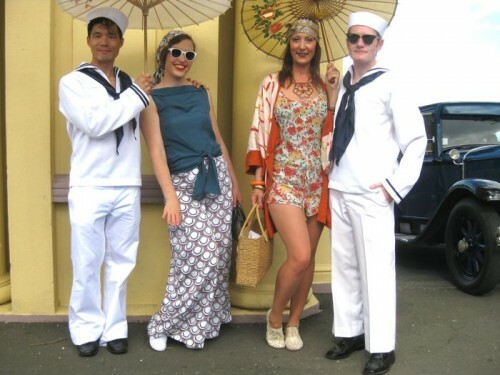 Napier holds an annual Art Deco weekend because an earthquake (and resultant fire) on Feb 3 1931 devastated the city, killing 256 people in the greater Hawkes Bay area, and necessitating the rebuilding of the entire downtown business district. All the rebuilding was done in the Art Deco and Spanish Mission style. 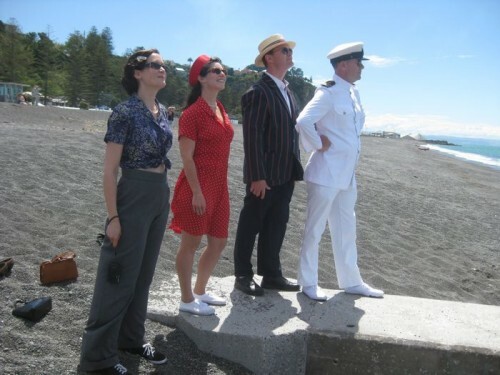 So every year Napier holds a festival to celebrate it’s Art Deco heritage, and commemorate the earthquake. Or so goes the official line. Sadly, my impression was that the festival was really just an excuse to sell stuff, wear silly clothes with only the barest veneer of historicism, and drink too much. There were a few tours about architecture, and a 20 minute ceremony about the earthquake, but I found the lack of history and recognition of why the event was held vastly disappointing. Also, the whole event puts a huge emphasis on the 1920s. The official posters are almost always 1920s in style, and depict people in 1920s clothes. The tour guides and Art Deco trust board, as a whole, wear truly dreadful pastiches of 1920s styles. I don’t get it. The earthquake happened in 1931. The city is a 1930s and 40s city. Why not focus on that and celebrate that? To me, ignoring this basic fact, and glazing over the history, does those who died, and those who survived and rebuilt, a great disservice. So the weekend was a bit disheartening for me as a historian. It was a fun event, but I never felt that it taught me anything, or pushed me, or challenged me, or gave me something to aspire to as a costumer or historian. It was, however, a wonderful weekend for bonding. I drove up with Claire of The Vanity Case, and Rachel who modeled the Vionnet dress, and stayed in a dorm at the Criterion Art Deco Hostel with them and five other fabulous swing dancing ladies (and almost one fabulous swing dancing guy, but he got rearranged out at the last minute). 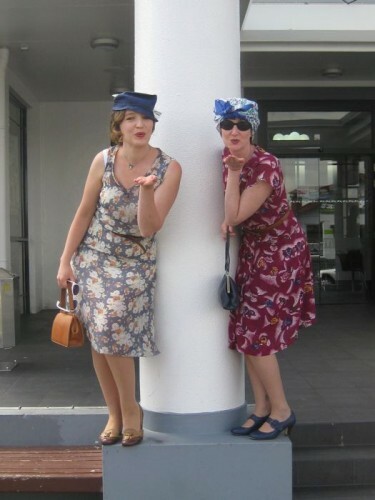 We had the most fantastic time dressing up together and trading accessories and stories and lending each other slips. 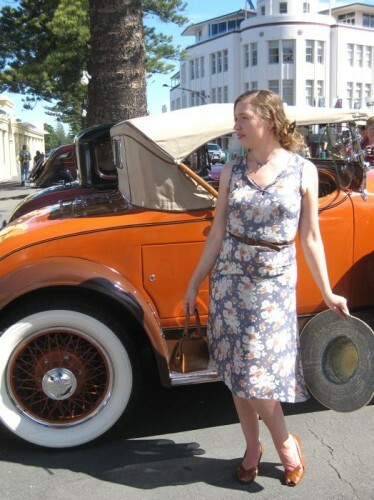 I got to meet swing dancers from all over New Zealand, and even two Art Deco aficionados from Southern California. So that part was well worth it, and hopefully we can be the new vanguard that brings life, and interest, and depth, and history to the Art Deco Weekend. Or just gorilla hunts. Those are good too. So, without further ado, masses of photos. These are meant to give you a bit of an overview of the event, and a sneak peek or two at some of the things I sewed. I’ll post more photos of those later. 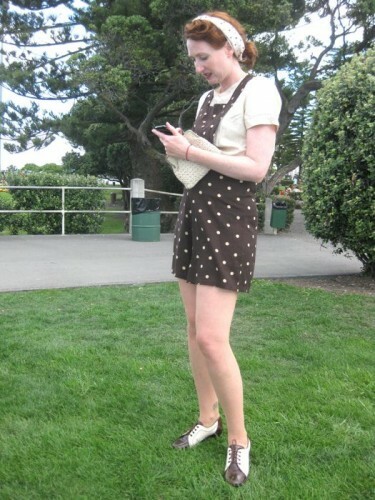 Wore the Frumpy Dress, my brown oxford pumps, and my marcasite and cameo necklace. Claire did my hair, we went op-shopping, checked into the Hostel, visited with all the swing dancers, had Turkish for dinner, and one dreadful dance (not my partners fault). Wore my newly finished beach pyjamas, entered the reproduction costume contest (hated it, always do, must just acknowledge I’m not an exhibitionist), stood in the fountain to cool off, watched a friend & dorm-mate with the Bathing Belles competition (woot woot! ), changed into a linen sailor skirt and blouse, stood in another fountain, changed into my green silk pretend-30s dress and a finished off with a few reasonable dances. Wore my newly finished red, white & blue chiffon dress. Spent a lot of time walking around the streets of Napier getting sunburnt and trying to remember where I parked the car. 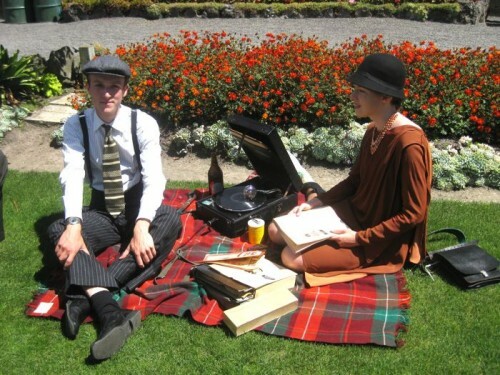 Went to the Gatsby Picnic (really? Couldn’t come up with something more unique to NZ?) 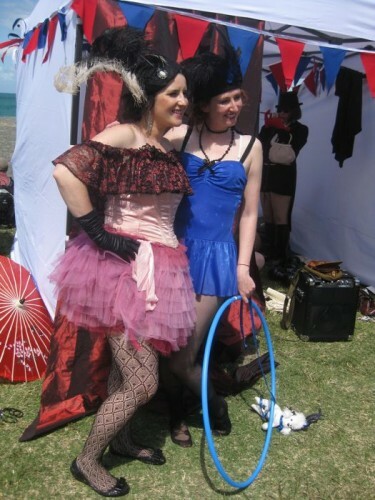 and hung out and danced at the Swing crowd’s circus-themed tent. 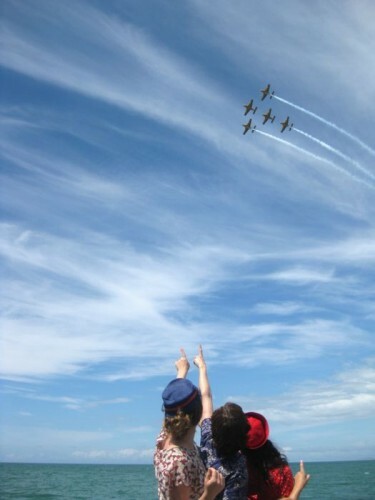 Had a lovely photoshoot on the beach while vintage planes and a not-exactly-period helicopter did tricks. Spent more time walking around, getting sunburnt, and trying to find the car. And then drove home and was sad. Hmm, I’ve often wondered about that myself – the confused 20s/30s thing etc. I suspect the event started off far truer to what you expected but over the years has unravelled due to the human need for variety and attention span of a gnat. You all looked AMAZING by the way! 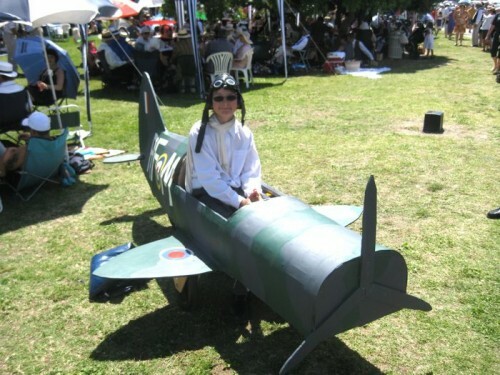 The intriguing thing is that the event has no variety – apparently it is exactly the same, year after year after year. And efforts by people to introduce variety have been rebuffed by the Trust. But I still might try! The frumpy dress is back! Yay! I actually LOVE that one! Running around in a fountain on a hot day sounds AMAZING right now–I can’t wait for summer and chances to hop in fountains (as long as security guards and employees aren’t around–I think they keep my picture and spread it around so that people know to let me have no fun whatsoever). Oh, yay! I love it too 😉 Even Mr D agrees it isn’t frumpy anymore. 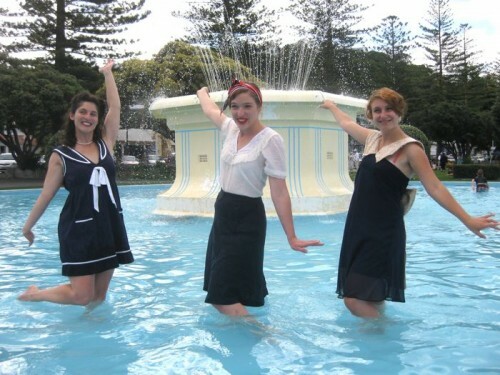 If you like fountains, you’d LOVE Art Deco Weekend. They certainly aren’t fussed about people in them – there are half a dozen along the waterfront, and kids use them as swimming pools, and there are always people in them, and nary a sign saying “No bathing in the fountain”. You are, as ever, perceptive. It isn’t really a historical event in the sense that you and I understand the term. I agree with Mrs C that you probably should pass that on to the Trust Board. 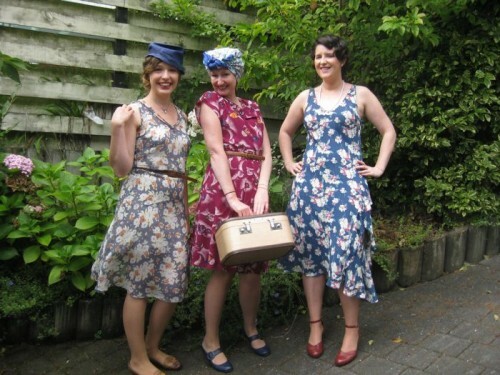 Regarding the proliferation of ‘20s styles though, I think that could be period accurate for NZ. NZ is a long way from the rest of the world, and until quite recently NZ’s fashions routinely lagged behind those of America or Europe. The time lag could be several years. Thank you. I’d agree with you about the 20s styles, except that photographs of Napier just before and after the earthquake show that the time lag wasn’t nearly that bad. Also, the 20s styles on display are very much the extremely sparkly, avant garde, ‘flapper’ style – not at ALL what would have been worn in Napier, even in the 1920s! I can’t see Napier having a lot of flappers or being very avant garde. I would expect NZ to have been comparatively conservative. Oh, I LOVE the idea, and think it is fantastic. We’ll talk. Was that dress from a vintage pattern? Do you mean my blouse? It’s not from a pattern – it’s from necessity. It’s made from pieces of a kimono lining, just the shape they are! I’ll post about it in a few days. Yes, it was your blouse. I just came home from work, glanced at it and started Google for a pattern that would produce the same outfit. That is awesome, it looks like an outfit out of the 1920’s fashion catalog. Simple yet elegant. And I will be looking forward to seeing it. I expect that part of the problem (with the costuming, I mean) is that people have a lot of preconceptions about the 1920s and prefer them to the 1930s. And I don’t think very many people even have a good idea of what 1930s fashion is like, so they don’t know to look for bias cuts, etc. But you guys look great! Thank you for the compliment on us! I do agree that the perception of the 20s is clearer, and it may be a bit easier to dress that way – so I totally excuse the hoi polli. 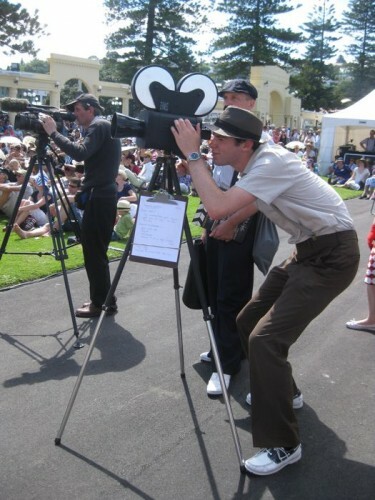 My disappointment is with the organisers – it’s their job to educate and create a model for others to follow – to create an event that is deeper and more meaningful than a shallow pastiche. It may have been unauthentic but it did look like fun. I figure it’s 2012…. You make some points but I wouldn’t let authenticity get in the way of a good weekend… 😉 Looks like you had fun. Oh yes, I did enjoy myself! And I’m not asking for complete authenticity – it’s not Colonial Williamsburgh after all! I’m just asking for more of an acknowledgement of the history, and more of an attempt at accuracy when there is a bit of a dress up going on. …Awww … thank you! Swimming in the fountain doesn’t take any guts when everyone else is doing it – you don’t feel the least bit outrageous. And they are much more casual about things like that here in NZ. I do feel like I can plan better next time, and maybe add some of my own history. 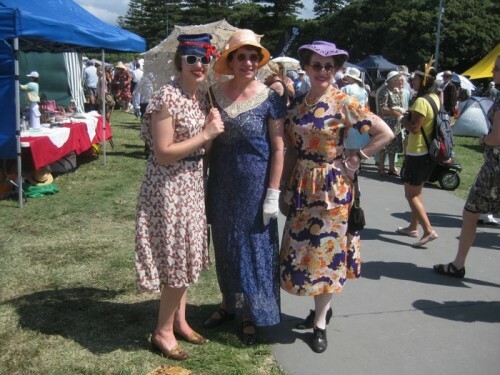 It was so fantastic to meet Mary and Corinne and compare vintage friends with them. Making that sort of connection is really the highlight of events like this, no matter how well done they are. I wish I had put it together that you were in SoCal too! I love that you finally went (although ‘twould have been amazing to go together for our first times). If you and your friends can in any way help shape the festival, I say DO IT! You have the drive and will and know enough people that you can make a fuss and shake things up. It can only become better because of your efforts (that is, if you feel up to it; I know how busy you are!). What fun!!! You all look amazing!!! Ooooh, I love the pants and knotted blouse look of your friend. Balancing tragedy with festivals is hard. For example, I saw nary a mention of Hurricane Katrina during the Mardi Gras celebration coverage on TV. Maybe people are too afraid of being a downer. You look great. Your friends look great. I know the accuracy of everyone else is off, but that just means that you can be the best dressed! This outfit? http://thedreamstress.com/2012/02/art-deco-weekend-roundup/img_6104/ Lauren is such a fabulous dresser – no cliches at all. Goodness – no mention at all of Katrina? At least Mardi Gras predated Katrina and had an existence beyond it. I feel like after so much time, commemorating the earthquake would add depth to the event, without it being too tragic. And with it being almost the 1 year anniversary of Christchurch, it was really weird that there was no acknowledgement of that. I’d rather be moderately dressed in a crowd of amazing outfits than best dressed among mediocrity. I can’t decide if that makes me virtuous or not! True true about commemoration. There could have been a sort of ‘NZ Earthquakes Then and Now’ installation, along with a collection plate to help those who are still struggling after a year. It could have tied it all up nicely. You are plenty virtuous. You come across in your blogs and emails as kind, positive, intellectual. Along with being kind, you are an artist and historian, so of course it is more important to participate in a good tableau, than a crappy approximation. Then again, Art is its own virtue. So you are still virtuous. What an interesting read – and I love your photos of you and your friends, you look very authentic for the 30s. Seems pretty annoying that the weekend is being run more as a 1920s flapper thing – but the 20s seem rather popular at the moment. Wow. You girls look great. Where did you get all this great dresses? They are adorable. 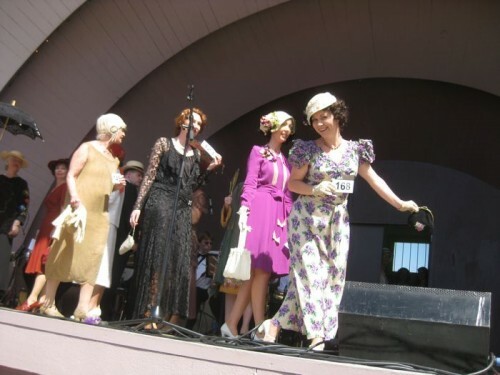 I got to see Corinne’s dress at our Deco Fest on the Queen Mary. Wow! It was so neat. Thank you! I’m glad to be able to spread the joy. It was such a treat to meet an international costumer.